Joe Schmidt insists Paddy Jackson has done enough to ensure Johnny Sexton will not be an automatic selection for Ireland’s RBS 6 Nations clash with France. Ulster fly-half Jackson equalled the Six Nations record of nine conversions in one match in a flawless kicking display as Ireland thumped Italy 63-10 in Rome. The 25-year-old bossed Ireland’s backline again as head coach Schmidt’s side claimed a record Six Nations win over the sorry Azzurri, with CJ Stander and Craig Gilroy both claiming hat-tricks. Schmidt confirmed he expects Sexton to be fit to face France in Dublin on February 25 after calf trouble - but admitted the British and Irish Lions playmaker could now have to battle Jackson for the start. 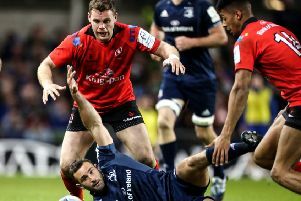 “Johnny has proven that he can come straight back into a side and hit the ground running, and he’s done that for us on other occasions,” said Schmidt. Jackson equalled former England star Johnny Wilkinson’s record of nine conversions in a Six Nations match as Ireland romped past Italy at the Stadio Olimpico. Keith Earls claimed a brace and Garry Ringrose a neat score too as Ireland coasted to a nine-try victory. Stander became the first forward ever to score a hat-trick in the Six Nations in a bullish, man of the match performance. Italy’s capitulation was such that Gilroy claimed his treble inside 20 minutes, and Ireland secured their maiden Six Nations bonus point in just 34 minutes. Schmidt expects Sexton, Peter O’Mahony and Andrew Trimble all to return to contest selection for the France clash, with Ireland now considering their campaign back on track after the 27-22 loss in Scotland last weekend. “I think Paddy certainly learned a lot in South Africa through that summer series,” said Schmidt. “He learned a lot in November as well, particularly in that game against New Zealand where he came under a lot of pressure and had to make some decisions with very little time and space. “And then again last week he did very well to lead us back into the game. “He kicked well again today, but his second conversion was one of the ugliest I’ve seen! “The flight of the ball it looked like a wounded duck and when he turned around to Richie he couldn’t quite believe it had gone over either.